Team Paraluna Cosplay recently used Worbla’s TranspArt and resin to make glass slippers for their Cinderella costume. They detailed the process below! 2. PATTERN: Then wrap the shoe in foil and then cover it with painter’s tape. 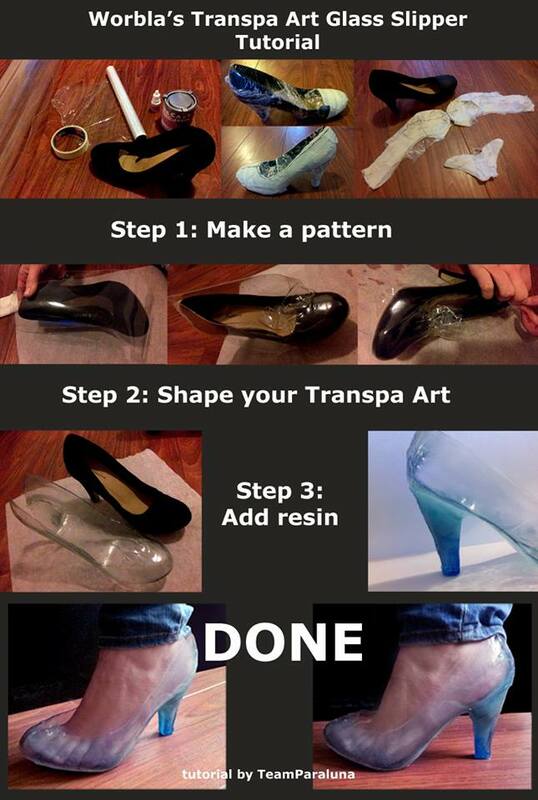 You can then draw your patterns directly on the shoe! After you do that, carefully cut out the pattern. Pictured is a pattern for both the sides of the shoe and sole, and the smaller part is the heel. 3. SHAPING: Then slowly start heating the Transpa Art around the shoe. Be very careful, it will get hot and melty! If you want to smooth it out, the best way is to press a damp cloth to the hot Transpa Art. That way you can smooth it out without burning your fingers. :) Work your way around the nose of the shoe, over the sides to the back. Put on the heel separately. You can fuse the Transpa Art seams together by heating them up until it looks like jelly, and then firmly pressing the edges together with your damp cloth. Continue until you’ve got the entire shoe covered. 5. RESIN: Then it’s time to fill the heel with resin. Normal resin will cure transparant, but I decided to add some tints to my resin to get a blue gradient and make it look extra fancy ;) Slush some resin through the base of the shoe and along the sides as well to strenghten it. 6. FINISHING UP: Insert some gel pads for extra comfort aaaaaandd…… DONE! !